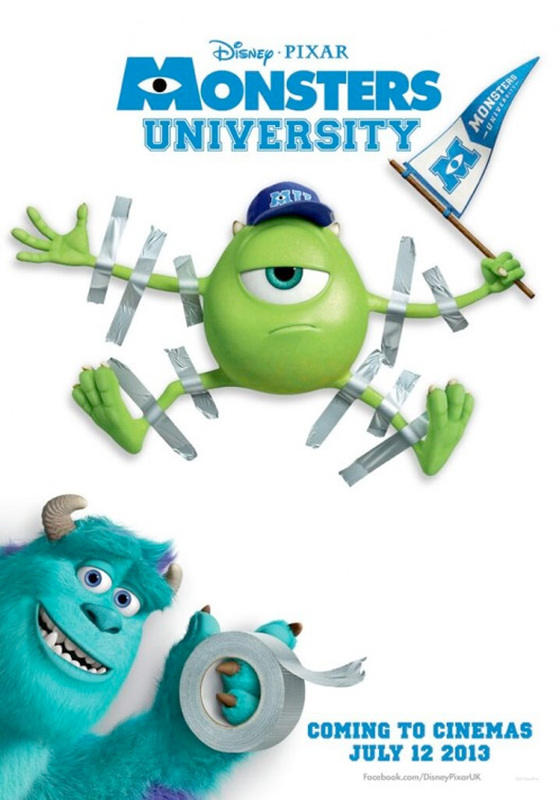 Stealing an idea from George Lucas, PIXAR decided to come out with a “prequel” to Monsters Inc., which I think was genius from a business point of view. Not only will families with kids flock to the film, but the college crowd who grew up on Mike and Sulley will too. And flock they did! After missing out on not one but TWO sold out showings, we decided we’d better go an hour early if we wanted to get the best seats in the house! 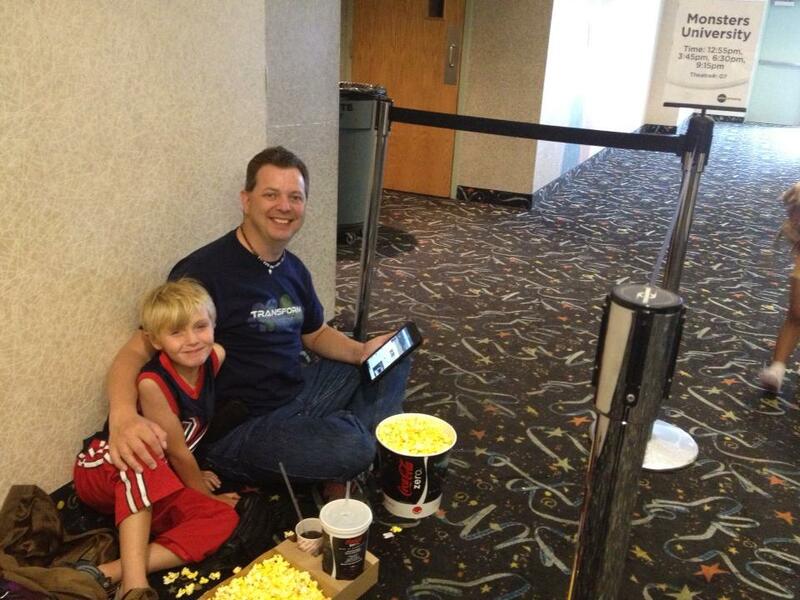 Luke doing his first movie “camp out,” but well supplied! I’ll link to the official Kidology Review coming shortly from one of our expert reviewers, but I wanted to post some of my thoughts. NOTE: I AM going to include spoilers from this point forward, so if you haven’t seen it, stop reading after this paragraph, and just go see it. 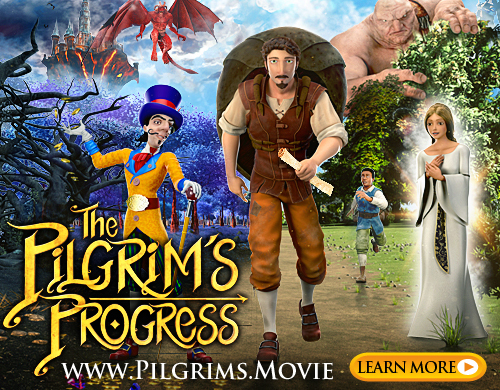 It’s a great film with super messages for everyone on friendship, forgiveness, teamwork, and as my blog title suggests, never giving up. Mike is a little monster who, quite simply, isn’t very scary. But after an experience as a young monster early in the movie at the Scream Power Plant at the heart of Monstropolis, (I’ll leave that spoiler out, for those who chose to read on), he sets his heart and all his effort on becoming a Scarer at the Power Plant. It is his dream and life purpose. 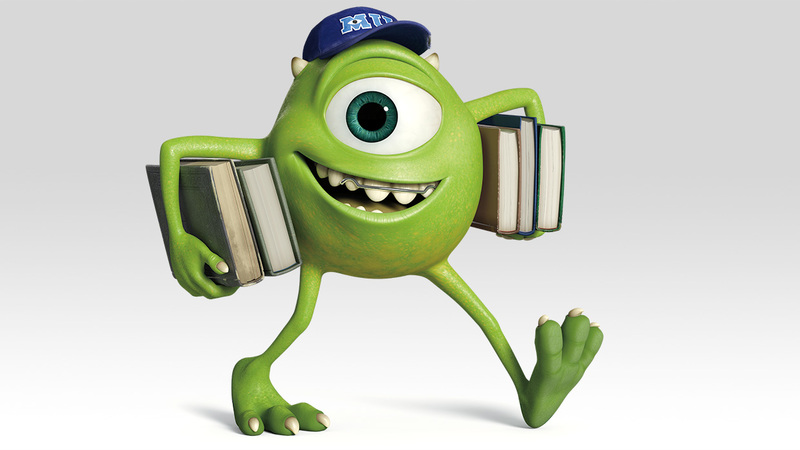 The movie quickly shows him studying hard and getting good grades to get into the college of his choice, Monsters University, rather than the rivals, Fear Tech or Scary University. Despite all his hard work, and he works and studies harder than anyone else, his lack of “natural scariness” seems to spell nothing but failure. Rather than summarize the entire movie since you’ve either seen it or will, I will to get to my point. Through it all, Mike never gives up. There is one moment of despair where he almost does, but that is when reconciliation happens between Mike and his former rival, Sulley. As it turns out, Sulley had been depending on natural talent and a family reputation rather than hard work to succeed, yet he was seeing the same amount of failure. Working together, they end up doing the impossible. As great as that is, it isn’t what I like the best about the film. There was something else I really liked, and I’m curious if others caught it. In the process of doing this incredible “thing” at the end (still avoiding the details), they break some rules and to my surprise, they are expelled from Monsters University. I really expected them to be forgiven and allowed to re-enroll due to the amazing “thing” they did. The intimidating teacher I suspected of being evil the entire movie turns out to be just stern and intimidating. While she admits her surprise at their success, she doesn’t extend grace. They still have to leave the school. Could the message, especially to to college kids,be that the ends do not justify the means? You may accomplish good, but you may still have to accept the consequences? Then came what I loved most, and my Patriotic side nearly burst. Since they flunked out of Scare School, they decided to take on what was offered once as an insult: a job in the mail room at the Monstropolis Power Plant. It reminded me of Joseph in the Bible. First, sold as a slave, he decided to be the best slave he could be, and in time was promoted to running the entire house of the captain of the guard of Pharaoh. His positive attitude, even as a slave, earned him that promotion. Then, when Joseph was falsely accused and thrown into prison, he didn’t pout and complain Again, be decided he would just become the best prisoner that prison had ever seen, and soon he was put in charge of the entire prison. In time, he rose to become the second in command of all of Egypt! His literal childhood dream came true. That is exactly what Mike and Sulley did. They immediately set out to beat the “most mail delivered” record. And they did. Next, we saw through some pictures put up over time in Mike’s locker that they went on to be janitors and decided to be the best janitors ever. Then they served soup, and they put their hearts into that. Finally, there was an “Employee Scare Try-Out,” and they won. Their dream came true! It took time, hard work, and patience, but they DID became official Scarers! That is a message MUCH NEEDED for kids today in our country. Hard work, patience, humility, determination, and dedication to a dream will in time product results! Just like John D. Rockefeller, Mark Zuckerburg, Ansel Adams, Steve Jobs, Bill Gates, Ty Warner, LeBron James, Kobe Bryant, John Travolta, Johnny Depp, Tom Hanks, Peter Jennings, Steven Spielberg, Thomas Edison, Walt Disney, George Washington, Benjamin Franklin, and even Abraham Lincoln, they fulfilled their dreams through hard work and focus, having never graduated from college! They didn’t expect anything to be given to them, they worked hard for it. Too many young people today expect to graduate from college and be given a six figure salaried career. They aren’t willing to work in the mail room, be the janitor, serve soup, or flip hamburgers – and be the best hamburger flippers their fast food joint has ever hired. That is the secret to seeing your dream come true. I am blessed to own and run my own business, but that only came after decades of mowing lawns, flipping burgers, delivering legal documents, valet parking cars, organizing plumbing parts, and being the best children’s pastor I could be while pursuing a God-given dream I had when I was 19 and a calling I received when I was 10. I guess you could say, “Be Like Mike.” Pursue your dream, and if one door closes, find another way. And if God is on your team, you can only win, if you never give up! He will bring along the Sulleys in your life to help you, humble you, teach you, and join you in your quest! PS: Stay after the credits. Our family were the only ones who did… and it was worth it. HOW TO DO THE U-TURN CARDS! You always come up with the coolest way to look at things. Keep it coming. I too loved this movie, I laughed, I teared up(what can I say I am an emotional person LOL) I did also notice the idea of hard work and pursuing your dreams and the woven theme of friendship and how we all need it in our lives. Thanks for this review. Sneak Peek: I'm Launching a Podcast! the Kidhelper is now a Blogger!